In Online Quizzes, students must answer a set number of questions in each activity before receiving a final grade. This page details how students can retake quizzes to increase their final score on each activity. How am I graded in Online Quizzes? 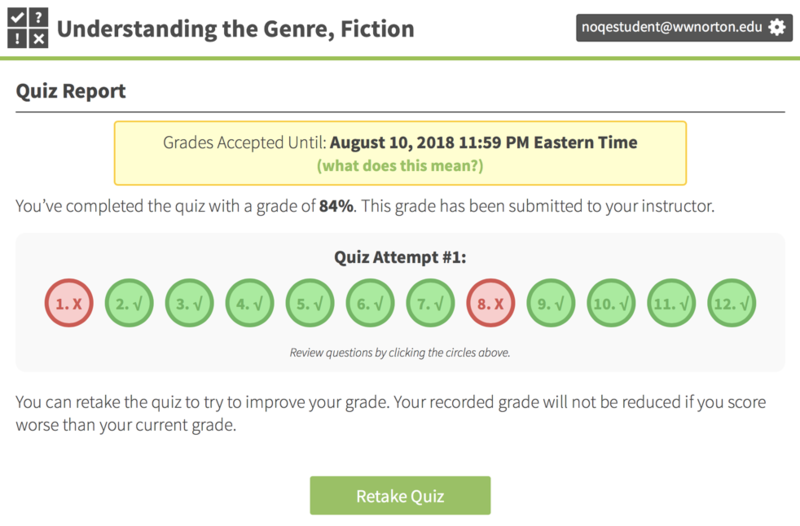 To receive a grade for an Online Quizzes quiz, you must answer all of the questions in the quiz assigned by your instructor. After answering 1 question, you will see what your current score is for the quiz. Once the set number of questions has been answered, you will receive a final score and a Quiz Report that will give a detailed description of the attempt. You will be given an option to Retake Quiz to improve your final score. Your grade is calculated by averaging the number of questions you scored correctly out of the total number of questions in the quiz. Questions answered correctly on your first attempt will be scored as 100 points and any questions answered incorrectly on your first attempt will be scored as 0 points. So, for example, if you answer 2 out of 12 questions wrong, your final score will be an 83% (1,000 earned points divided by 1,200 possible points equals 83%). Online Quizzes never stops you from retaking the quiz and you can attempt the quiz as many times as necessary to achieve a final score of 100%. How do Grades Accepted Until (GAU) dates work? Grades Accepted Until dates are similar to due dates. Your instructor sets a Grades Accepted Until date for an activity, and once the date passes, your work will be collected and you'll no longer be able to improve your grade. However, you'll still be able to access the activity and answer questions for self-study purposes.